Buying a diamond typically done with some forethought because it is such an important purchase. Fortunately, the most important elements when purchasing a diamond can easily remembered because they begin with the letter “C”. You may have heard of “the four C’s” which are cut, clarity, color and carat. Learning about the 4 C’s will help guide you on your way to making the perfect diamond purchase. Diamond color is all about what you can’t see.The color grade is measured by the amount of color, or lack there of, within the diamond. The process for grading color is measured by looking at the diamond face down on a white background using controlled lighting and precise viewing conditions. The diamond is comparing to diamonds that are graded according to the Gemological Institute of America’s color grading scale. Many of the diamonds you will find within a jewelry store are colorless or slightly yellow. The Gemological Institute of America has established an industry standard scale for grading diamond color. The scale is based on the visible color of the diamond. It starts at D, a colorless diamond. Diamonds graded G will appear colorless facing up but has slight color when facing down. Color will be more visible when you get in the K grade diamonds. Diamonds with a Z grade which is a light yellow colored diamond. Many of the color distinctions are so subtle that the untrained eye may not see any difference but it makes a difference in the quality and price of the diamond. N-R: Diamonds in this color range have an easily seen yellow or brown tint, but are much less expensive than higher grades. S-Z: For almost all customers, S-Z diamonds have too much color for a white diamond. Diamonds are formed deep within the earth under extreme heat and pressure. Because of this they often contain unique birthmarks which are in the form of inclusions (internal) or blemishes (external). The clarity of a diamond refers to the absence of these inclusions and blemishes. Every diamond is unqiue. A diamond without inclusions and blemishes is considered flawless and are extremely rare making them very valuable. Most jewelers have never seen a flawless diamond. The Gemological Institute of America has a grading scale to determine diamond clarity. (FL) is considered a flawless diamond. A diamond with obvious inclusions and blemishes is graded an (I3). Most diamonds fall into the Very Slight Inclusions (VS) or Slight Inclusions (SI). Flawless (FL) – No inclusions or blemishes are visible to a skilled grader using 10× magnification. Internally Flawless (IF) – No inclusions and only blemishes are visible to a skilled grader using 10× magnification. Very, Very Slightly Included (VVS1 and VVS2) – Inclusions are difficult for a skilled grader to see under 10× magnification. Very Slightly Included (VS1 and VS2) – Inclusions are minor and range from difficult to somewhat easy for a skilled grader to see under 10x magnification. Slightly Included (SI1 and SI2) – Inclusions are noticeable to a skilled grader under 10x magnification. Included (I1, I2, and I3) – Inclusions are obvious under 10× magnification and may affect transparency and brilliance. The allure of an individual diamond mostly depends on the cut over anything else. Because it is composed of a generally transparent material, diamond lets light pass through it, even in its most rough condition. But early on in history, stone cutters realized that you can get extra sparkle if you facet the diamond, and they set about finding out the best combination of facet size and shape and angle to get the most sparkle. Eventually, one design with 58 facets became the traditional round diamond. It was shown to be the most efficient way to maximize the stone’s best qualities and this came to be known as the ideal cut. It remains the industry standard, and is the shape that most people recognize as being a diamond shape. Each precision cut can be as small as two millimeters in diameter. 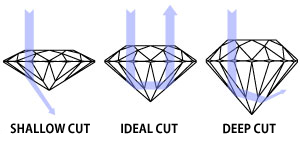 This does not mean that diamonds of the same size are equal when it comes to cut. A lot depends on the skill of the diamond cutter as even the slightest variance in the angle of a single facet or its size or its effect on the symmetry of the stone will affect its value. Diamond cutting is part art but within the confines of exacting scientific boundaries. This does not mean, however, that the diamonds that are cut to an ideal shape are automatically the best. The cut of a diamond has three attributes: 1.) Brilliance: the total light reflected by the diamond; 2.) Fire: the dispersion of light into the colors of the spectrum; and 3.) Scintillation: the sparkle or flashing when the diamond is moved. Part of he job of a highly skilled cutter is to determine what shape will be the best one to create the largest possible polished diamond from a given piece of rough. And rough diamonds come in all kinds of shapes. The most common diamond cut is a brilliant round diamond. Other cuts are known as fancy cuts which include marquise, pear, oval and more. A pear- or emerald-shaped diamond has as much claim to being perfect as the ideal cut, particularly if it produced a larger stone. In fact, most of the world’s biggest, most famous diamonds are not ideal cuts because the chief goal was to maximize their size. Diamonds and other gemstones are weighed in metric carats. It is derived from the carob seed, which is remarkably consistent in weight and shape making them the favored scale balances in ancient times. The scale was standardized in the early 1900’s when it was determined that one carat was 0.2 grams or 1/142 of an ounce. Just as a dollar is divided into 100 pennies, a carat is equal to 100 points. A half carat diamond is equal to 50 points. It is possible that two diamonds could weigh the same, however their values can vary based on the other cut, clarity and color. A majority of the diamonds used in fine jewelry weigh one carat or less. You’ve probably heard of 18 Karat gold. The term “Karat” is used to describe the purity of gold whereas “Carat” is the standard unit of weight for diamonds and other gemstones. Even a fraction of a carat can make a considerable difference in cost making precision crucial. Weight is often measured to the hundred thousandths of a carat in the diamond industry and rounded to a hundredth of a carat. Diamonds that weigh more than one carat are expressed in carats and decimals. A diamond stone weighing 1.08 ct. would be described as “one point oh eight carats.